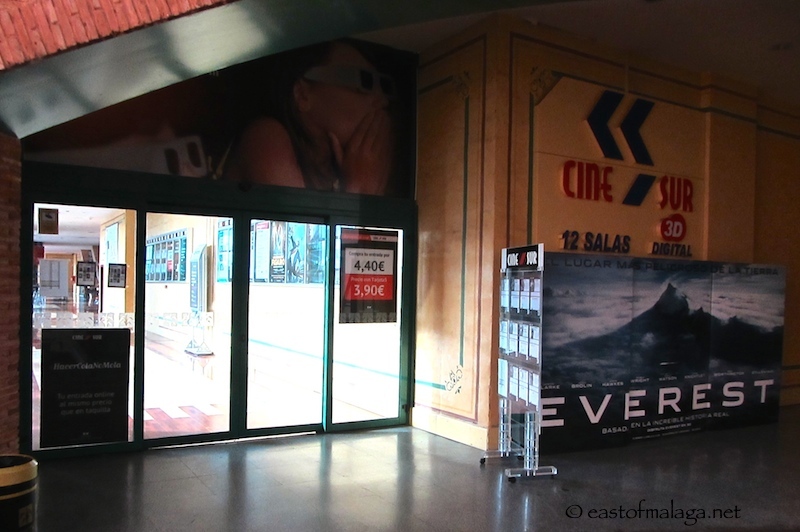 The only cinema regularly showing English language films in the Axarquía region is Cinesur in the El Ingenio shopping centre at Vélez-Málaga. Address: Avda.Juan Carlos I S/N, Vélez-Málaga. Tel: 952 547 309 – 952 547 267 – 902 504 150. This is an air-conditioned cinema complex featuring 12 screens and is upstairs, near the restaurant area, in the El Ingenio shopping centre. Price: 7.50 € (4.40 € on Wednesdays, only). 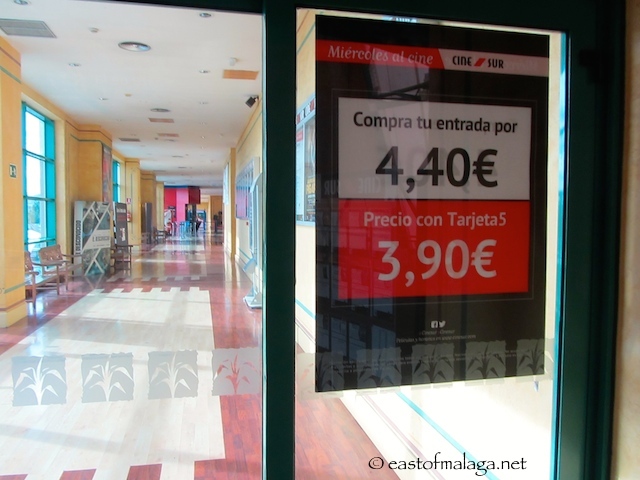 There is a discount card available at Cinesur called Tarjeta 5, which reduces the price of all shows to 5 euros. This means there is no need to wait for a Wednesday to get a good deal (though if you do go on a Wednesday and use your Tarjeta 5 card, you will get in for 3.90 € instead of the usual 4.40 €). Cinesur cinema was showing English language films ten years ago when I first came to Spain, but because of dwindling numbers of film-goers, Cinesur stopped showing them. 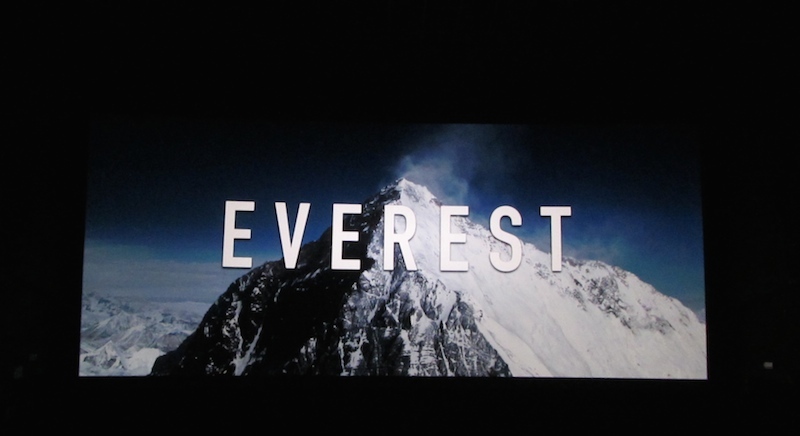 Fortunately, we have them back now – but when I went to see “EVEREST” a couple of weeks ago, there were just three of us in the cinema. Can I just say – please support our local cinema showing original version films – because if we don’t, they will stop showing films in English. I’ve got a special offer to encourage you to go to Cinesur at the El Ingenio centre. (Other cinemas throughout Spain are also taking part, details HERE). On the 3rd, 4th and 5th of November the twice-yearly “Fiesta del Cine” will be held throughout Spain, when tickets will cost just 2.90 €. First, you’ll need to register online at the official website to receive your personalised discount voucher. Then, between the 3-5 November when you go to the cinema, take along your voucher PLUS photo ID, and your ticket will cost you just 2.90 €. The Cultural Centre in C/Granada, Nerja have a Cineclub showing original version films. Check their website for details or telephone 95252 3863. The Yelmo Cineplex at Rincón de la Victoria show the occasional English language film, but they are not usually a regular feature there. Yelmo are, for example, showing Ed Sheeran – Live from Odeon Leicester Square on October 22nd. This is a 16-screen cinema, open daily. 4-screen cinema next to the Roman Amphitheatre, at the foot of the Alcazaba. This is a 20-screen cinema complex at Plaza Mayor, the huge shopping centre near the airport. Yelmo usually have at least a couple of the latest-release movies showing in English. VOSE = Versión Original Subtitulada en Español which means Original Version Subtitled in Spanish. **VO = Version Original means Original Version without subtitles. You might want to look if the original version was filmed in English! Always check the cinema’s website and/or telephone for timings, before you set off (especially if you are travelling to Málaga). You can usually buy your tickets online or, of course, at the cinema. Are you a film buff? Do you mind watching films with subtitles or do they distract you? This entry was tagged Andalucía, East of Malaga, lifestyle, Malaga, Nerja, Spain. Bookmark the permalink. WAKE UP PEOPLE!!!! IT IS NOT!!!!! IT’S THE SAME 10 PEOPLE DOING ALL OF THE VOICES!!!!! BLOODY ANNOYING!!!!!!!!! But having grown up with dubbing myself, I know that it seems perfectly fine – hell, you don’t even much notice it! – if you’ve never known anything else, that is. I used to be quite distracted by sub-titles at first, but I’ve got used to them, so I can ignore them now! Don’t think so, sorry – they are just automatically sent by WordPress whenever I post an article to the blog.